The book fair is back at Darien Elementary School! Students have found many new books to enjoy and fun pens, pointers and posters to take home with them. To celebrate the book fair, the week has been filled with spirit days, including wearing neon or bright colors, blue and gold Comet colors, class colors, favorite character, and hat days. Students have also brought in their loose change to help support the school library. 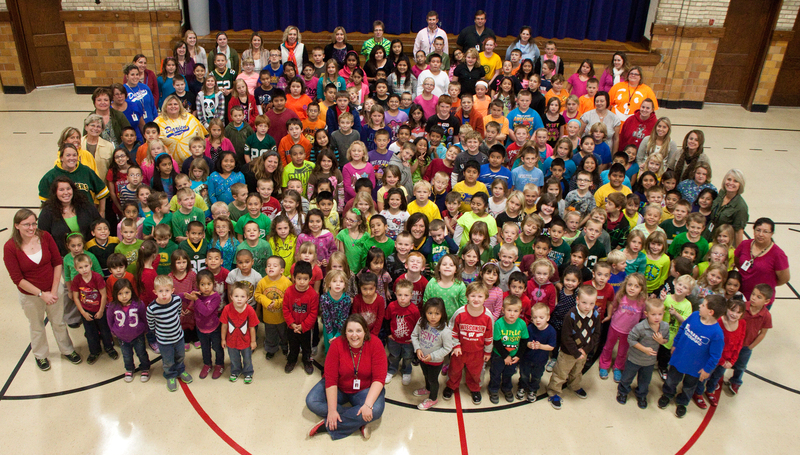 Also, to show their spirit, the whole school came together for an all school picture on class color day! Check out the pic above. This entry was posted in Darien Elementary School, Delavan-Darien School District, News Releases, Photo Galleries. Bookmark the permalink.